Perhaps the earliest example of dental implants were seashells found in the jaw of an ancient Mayan skeleton from 1,300 years ago. What’s the Difference Between DDS & DMD? As dentists we know we sometimes speak a slightly different, more clinical, language than our patients. We try not to be mysterious, but sometimes what’s common knowledge to us could be confusing to our patients. One common thing that patients want to know is the meaning of the different letters you see after our names: either DDS or DMD. So what’s the difference? Is one better than the other? Most patients, especially those in suburban areas near cities, have two choices for the types of dental practices they can go to. There are classic privately-owned practices, which are small businesses where the supervising dentist is also the owner. The professional teeth whitening process starts with a consultation with your dentist. Not everyone is a good candidate for teeth whitening, which is why you want to talk to a dentist before you have it done. 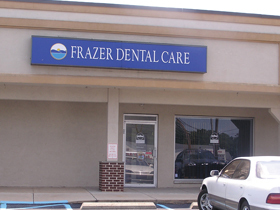 Our pledge to you is to provide the most personalized, effective dental care possible. Caring for your individual dental health is part of our larger goal of improving & supporting the overall health of the community. What Makes a Kids’ Dentist Different? If you’re looking to find the right dentist & establish a “dental home” for your family, you may wonder what the difference is between a pediatric dentist (a.k.a. a kids’ dentist) & a family dentist. After all, most family dentists see both children & adults. The color of their teeth is one of the top things people say they would like to change about their smile. Thankfully, teeth whitening is fairly simple treatment, but there are so many options for teeth whitening you may find yourself with a few questions. We think the most common and the most important question we hear is this: Why should I have my dentist whiten my teeth instead of using those drugstore whitening kits?